Earlier this year, the process began to turn off Hazelwood Power Station – often referred to Australia’s dirtiest coal-fired power plant. The move away from non-renewable energy may bring myriad environmental benefits, but the transition isn’t without its costs, including those with a human impact. Hazelwood has been a major employer in the Latrobe Valley region of Gippsland for close to half a century and towns like Morwell, Traralgon and Moe have long relied on the jobs created by the station. What's more, in recent years, the decline in the local logging industry and the collapse in the price of milk have further contributed to a rise in unemployment. 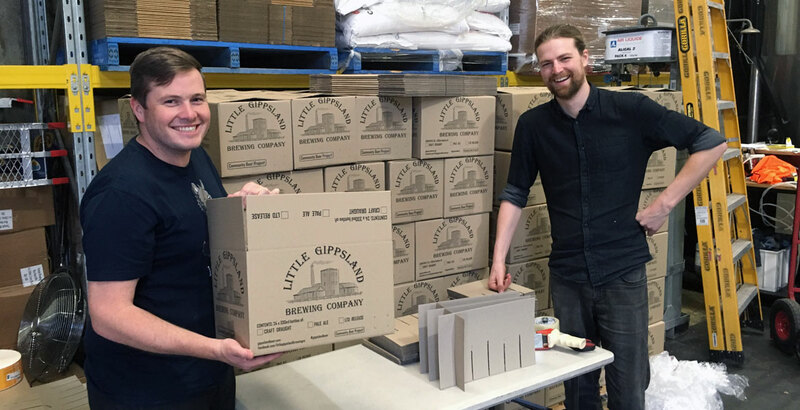 Against this background, and in the hope of encouraging people to invest money into the region, the Little Gippsland Brewing Co was born; a “community beer project” complete with a logo reflecting on the region’s industrial past. Aaron Falzon and Rhys Brown are the other two involved in Little Gippsland. All three grew up in the area and believed locals would be quick to embrace a local beer. 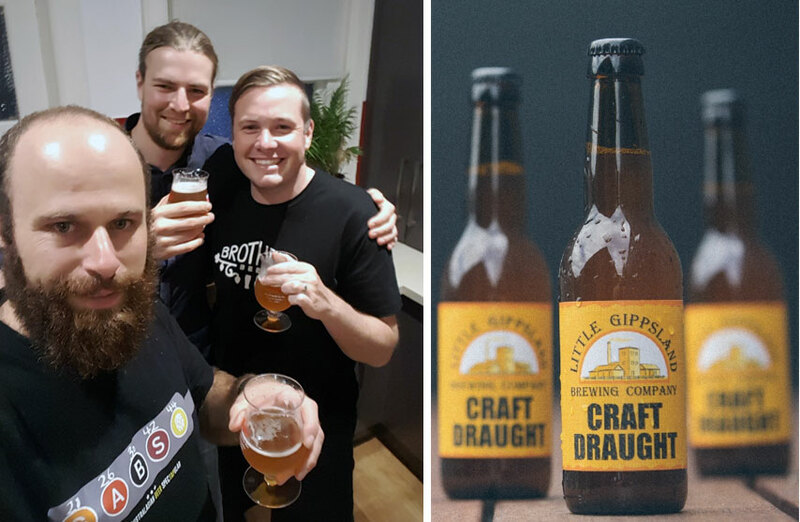 Aaron and Rhys were both longterm homebrewers and worked together on a recipe for Little Gippsland’s first beer, dubbed Craft Draught. Left to right: Aaron, Rhys and Dylan of Little Gippsland Brewing Co and their Craft Draught. The beer came to life after the trio attended the annual Cryermalt Good Beer Week Brewery Startup panel hosted by The Crafty Pint. There, they met Glenn Harrison while he was still head brewer at Temple Brewing. He was keen to help Little Gippsland brew its beer and the first batches of Craft Draught subsequently started to appear around the Latrobe Valley in early November. While Craft Draught might have the appropriate assonance to appeal to drinkers, the idea behind the name was to also attract acceptance in a part of the country where Carlton Draught has long ruled. “When we say it’s a craft take on a draught beer it gets more response then saying it’s a golden ale or something like that,” says Dylan. 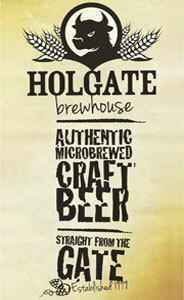 For now, the focus has been getting packaged beer into restaurants so the money flows into small businesses too. It’s a strategy that's so far proving successful, with 14 venues having embraced the beer, along with some local supermarkets, and more in the pipeline. While they might not be expecting to build new houses (or a new power station) off the back of their brewing company, Dylan, Aaron and Rhys felt there were plenty of projects and community groups in the area that need a bit of support. Already, local sports clubs and community buildings have had work done on them, with locals able to use the Little Gippsland website to suggest where any funds should go. To find out more about the Little Gippsland project, check out their website.